The episode is in parts. The first runs ten minutes and is in sections; it is set in King’s Landing. The first section is two minutes long; the opening image is of Tyrion’s eye. The second section is six minutes long; the transition is by family, from Tyrion to Tywin Lannister. The third section is two minutes long; the transition is by employment, from Littlefinger to Roslyn. The second part is five minutes long, and is set in the Riverlands. The transition is by hard cut, from Roslyn to Jaime and Brienne getting out of a boat. It features the death of three unnamed Stark men, two quick, one not. The third is two minutes long and is set in the Stark camp in the Riverlands. The transition is by dialogue, from Brienne saying she serves Lady Catelyn to Lady Catelyn. The fourth is four minutes long and is set on Dragonstone. The transition is by hard cut, from Robb storming out to the fires in the map room. The fifth is seven minutes long and is set in Winterfell. The transition is by image, from the fire that Stannis looks into to Theon’s fire. The sixth is four minutes long and is set in King’s Landing. The transition is by hard cut, from the courtyard of Winterfell to Tyrion. The seventh is one minute long and is set in the Stark camp in the Riverlands. The transition is by theme, from Shae’s vow to Tyrion to Robb and Talisa’s vows. The eighth is two minutes long and is set in Qarth. The transition is by hard cut, from Robb and Talisa to Daenerys, Jorah, and The Dothraki Who Isn’t Dead walking towards the House of the Undying. The ninth is three minutes long and is set in the Riverlands outside Harrenhal. The transition is by hard cut, from Daenerys within the House of the Undying to an establishing shot of rocks and cliffs. The tenth is four minutes long and is set in Winterfell. The transition is by family, from Arya to Bran and Rickon Stark. It features the death of Maester Luwin, euthanized by Osha. The eleventh is one minute long and is set in Qarth. The transition is by image, from Winterfell burning to Daenerys’s torch. The twelfth is two minutes long and is set in King’s Landing. The transition is by image, from Daenerys walking through a door to Daenerys walking through a door. The thirteenth is seconds long and is set at the Wall. The transition is by image, from Daenerys walking towards the camera to Daenerys walking away from the camera and towards the gate at the Wall. The fourteenth is three minutes long and is set in the Night Lands. The transition is by image, from Daenerys walking into the snow to Daenerys stumbling towards Khal Drogo’s tent. The fifteenth is two minutes long and is set in Qarth. The transition is by image, from Daenerys walking out of Drogo’s tent to Daenerys returning to the House of the Undying. It features the death of Pyat Phree, incinerated by dragons. The sixteenth is four minutes long and is set north of the Wall. The transition is by family, from Daenerys to Jon Snow. It features the death of Qhorin Halfhand, impaled by Jon Snow. The seventeenth is four minutes long and is set in Qarth. The transition is by family, from Jon Snow to Daenerys. 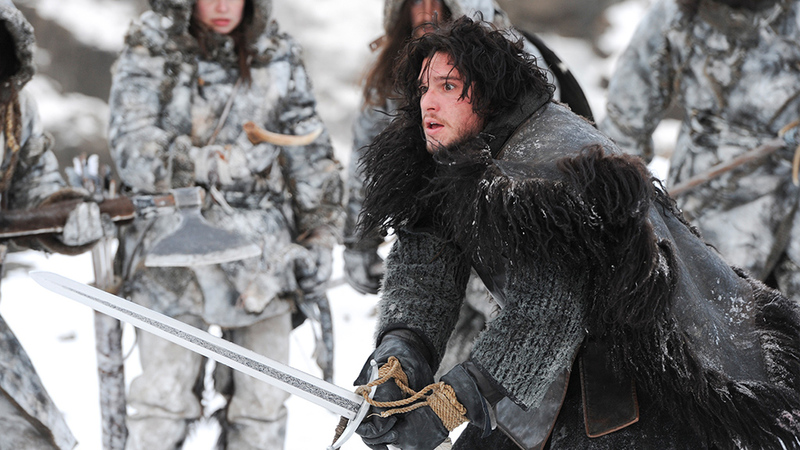 The eighteenth is two minutes long and is set at the Fist of the First Men, north of the Wall. The transition is from monsters of fire to monsters of ice. The final image is of a massive army of the dead, marching towards a riddle whose answer is chess. Structurally, it spirals outwards, beginning in King’s Landing, ending at the extremes of the world. With the exception of Daenerys’s disappearance, shoved somewhat ignobly between some Stark scenes, the end simply alternates between Qarth and the Wall, although it scores somewhat differently. The Westerosi politics unfold early on, meanwhile, with King’s Landing effectively squared away in the first scene. In this regard, it is the logical consequence of the season, just as much as “Blackwater” was. Play opened with a political world that magic was scraping at the edges of; it closes with a political world subsumed by magic. Daenerys’s vision in the House of the Undying serves as the biggest single part of this, a sequence that has her symbolically traverse the world. The image of a snow-covered Iron Throne, and of Daenerys emerging from the Wall, seen, in truth, for the first time this season are both breathtakingly well-done. It is a major departure from the books; one that is cited by book purists of the way in which the show is a lesser thing. It’s true, the book version of this sequence is a dizzying mess of images that allude to large swaths of Westerosi history, support the truth of Jon Snow’s parentage, prefigure the Red Wedding, and, in many cases, don’t even make sense as of yet in the context of the books, and may well never, so dense and allusive is the web of subjective history that Martin has woven. In Game of Thrones, meanwhile, it is merely very pretty. But, of course, the connection between Daenerys and the Wall is also considerably weaker in the show. The sort of hyper-detailed historical background that animates the book version of the scene is precisely what television can’t do as well as a medium. In many ways what is more significant is what is added; the farewell between Daenerys and Drogo, a character beat given to two skilled actors who acquit themselves well. The real problem is that it highlights the most unfortunate thing about the end of the second season, which is that for all the grandeur of the images, all the House of the Undying vision now contains is a restatement of the ice/fire dualism from the first season, as is the structural ending of alternating between Qarth and the land beyond the Wall, and that monster-to-monster final transition. Which in turn casts light on an uncomfortable truth: this basically just ended the same way as the first round of play. For an awful lot of characters, nothing has changed. Arya is on the loose again; Sansa is a prisoner in King’s Landing; Tyrion is back to being powerless; Daenerys has dragons and is vaguely pointed at Westeros; Robb is doing well but taking risks; Stannis is on Dragonstone without much power. The last particularly grates; for all that “Blackwater” was spectacular, its result turns out to be that nothing of note has changed in King’s Landing all season. Where there are major changes, they are oddly swallowed by the narrative. 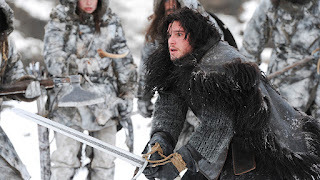 Jon Snow’s situation has massive implications, and four minutes of screentime. Jaime and Brienne are a delightful double act with great potential for the next season, but they’re placed early in the episode. Arya has a profound change in her trajectory, even as her overall circumstance is essentially the same, but this is necessarily subtle. The sacking of Winterfell is played so heavily for tragedy that the strangeness of it - which is a major mystery with massive implications for the plot - is swallowed. Theon’s gone through a lot, but the fact that his fate is unknown means that, perversely, it’s exactly where it was before he was a major character. A lot has happened; not much has changed. It’s been a high-scoring draw: thrilling, yet slightly unsatisfying. There is overall motion; it’s just, in most regards, unsatisfyingly slow. There are many aspects of play that have been refined since 2012. For instance, the choppy and fragmented style of the middle of Season Two is almost entirely abandoned at this point. And indeed, the problem of glacial pacing will get better, at least in comparison with the books, from which the problem is inherited. (Martin’s pathological worldbuilding contributes massively to this; whereas the show, by compositing and eliminating minor characters, keeps its new character to death ratio much closer to even, the books spiral out more and more diffusely.) But unfortunately, it is a problem that is first going to get a good deal worse. A Brief Treatise on the Rules of Thrones will be going on indefinite hiatus. I imagine some sort of Game of Thrones coverage will go on for Season Six, but I wouldn’t expect anything before that. The Super Nintendo Project is back on August 3rd with Lemmings. It's a shame this is going on indefinite hiatus, though I get the feeling season 5 beat the interest out of you, which is... fair enough really given a lot of the decisions made. >The Super Nintendo Project is back on August 3rd with Lemmings. Wait, Lemmings was on the SNES? How... how did that work? Even more interestingly - Lemmings was also on the NES.